Representatives from 47 of the world's most disadvantaged nations have pledged to generate all their future energy needs from renewables. Members of the Climate Vulnerable Forum issued their statement on the last day of the Marrakech climate conference. Bangladesh, Ethiopia, and Haiti, among others, say they will update their national plans on cutting carbon before 2020. Delegates here welcomed the move, saying it was "inspirational". These two weeks of negotiations have been overshadowed to an extent by reaction to the election of Donald Trump to the US presidency. But in an effort to show that even the world's poorest countries are committed to dealing with global warming, the Climate Vulnerable Forum (CVF) members have issued a promise to fully green their economies between 2030 and 2050. Termed the Marrakech Vision, the plan promises that the 47 members will: "strive to meet 100% domestic renewable energy production as rapidly as possible, while working to end energy poverty and protect water and food security, taking into consideration national circumstances". The countries involved are keen supporters of keeping the global temperature rise this century under 1.5C, a target agreed during negotiations in Paris last year. "We are pioneering the transformation towards 100% renewable energy, but we want other countries to follow in our footsteps in order to evade catastrophic impacts we are experiencing through hurricanes, flooding and droughts," said Mr Mattlan Zackhras, a minister from the Marshall Islands. 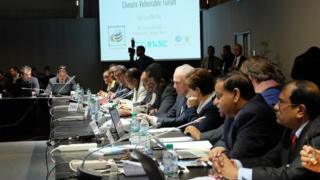 The CVF countries also pledged to update their national climate-cutting plans before 2020 and to develop long-term plans as soon as possible. There was also a hint of impatience among CVF members with the progress being made by richer countries. "We don't know what countries are still waiting for to move towards net carbon neutrality and 100% renewable energy," said Edgar Gutierrez, Costa Rica's minister for the environment. "All parties should start the transition, otherwise we will all suffer." Other negotiators here have warmly welcomed the move here at the meeting. "The commitments made by the Climate Vulnerable Forum today are both impressive and inspirational," said Miguel Arias Canete, the EU climate commissioner. "They have once again shown their moral leadership in this process with real-world commitments to action. These countries are already living the terrifying reality of climate change today and their very existence is on the line. The EU stands with them and their commitment to greater ambition in the years ahead." However, there are concerns that any possible pullout from the Paris agreement by the US could impact that fund. While the America has promised $3bn at present for the initial capitalisation of the green climate fund, it has only paid some $500m to date. Donald Trump has promised that he will stop US federal dollars being spent on global warming initiatives. "$2.5bn dollars was supposed to be in the mail, but now that the mailman has changed that might be a bit of an issue," said Tosi Mpanu-Mpanu, from the DRC, who is also the chair of the group of Least Developed Countries in these talks. "If the US pulls out and the others cut, it creates uncertainty and that can hinder ambition. "If they have the impression that climate finance is a fluke, and nothing is materialising, then of course it is going to hinder ambition and climate action from developing countries."